One of the most important areas of research in evolutionary psychology now is the possibility that evolutionary circumstances actually selected for a propensity towards certain false beliefs. That is, more and more research is presenting us with evidence that natural selection built us to have some false beliefs. It turns out that in the right sorts of circumstances, some false beliefs may have provided early hominids with survival advantages. The ubiquity of religious belief, and the long list of peculiar cognitive behaviors surrounding it, suggest that it should be on that list of evolved misbeliefs. Daniel Dennett and Ryan McKay give a thorough overview and analysis of the latest research into these questions in The Evolution of Misbelief from Behavioral and Brain Sciences. Then a long list of prestigious scholars respond to their arguments. Dennett and McKay argue that of all of evidence that has been presented for evolved misbeliefs, the case for positive illusions about oneself and ones close to you is the strongest. "The evidence indicates that there is a widespread tendency for most people to see themselves as better than most others on a range of dimensions. This is the “better-than-average effect” (Alicke 1985) – individuals, on the average, judge themselves to be more intelligent, honest, persistent, original, friendly, and reliable than the average person. Most college students tend to believe that they will have a longer-than-average lifespan, while most college instructors believe that they are better than-average teachers (Cross 1977).Most people also tend to believe that their driving skills are better than average – even those who have been hospitalised for accidents (see, e.g., McKenna et al. 1991; Williams 2003). In fact, most people view themselves as better than average on almost any dimension that is both subjective and socially desirable (Myers 2002). Indeed, with exquisite irony, most people even see themselves as less prone to such self-serving distortions than others (Friedrich 1996; Pronin et al. 2002; Pronin 2004)." Researchers have argued that these biases produce false beliefs that are the result of the proper evolved functioning of our cognitive faculties. Religious belief, one might think, is prime for this sort of explanation. But Dennett and McKay contend that the consensus now is that the propensity towards religious belief is the by-product, not the direct result, of evolutionary pressures. It may be the result of a Hyperactive Agency Detection Device, selection pressures against cheating, or selection for cooperation in social settings. Atran, S. & Norenzayan, A. (2004) Religion’s evolutionary landscape: Counterintuition, commitment, compassion, communion. Behavioral and Brain Sciences 27: 713–70. Atran, S. (2004) In Gods we trust: The evolutionary landscape of religion. Oxford University Press. Barrett, J. L. (2000) Exploring the natural foundations of religion. Trends in Cognitive Sciences 4(1):29–34. Bering, J. M. & Johnson, D. D. P. (2005) “O Lord ... you perceive my thoughts from afar”: Recursiveness and the evolution of supernatural agency. Journal of Cognition and Culture 5(1/2):118–42. Bering, J. M. (2002) The existential theory of mind. Review of General Psychology 6:3–24. Bering, J. M. (2006) The folk psychology of souls. Behavioral and Brain Sciences 29:453–98. Bloom, P. (2004) Descartes’ baby: How child development explains what makes us human. Arrow Books. Bloom, P. (2005) Is God an accident? Atlantic Monthly 296:105–12. Bloom, P. (2007) Religion is natural. Developmental Science 10(1):147–51. Boyer, P. (1994) The naturalness of religious ideas: A cognitive theory of religion. University of California Press. Boyer, P. (2001) Religion explained: The evolutionary origins of religious thought. Basic Books. Boyer, P. (2008a) Evolutionary economics of mental time travel. Trends in Cognitive Sciences 12(6):219–24. Boyer, P. (2008b) Religion: Bound to believe? Nature 455(23):1038–39. Guthrie, S. E. (1993) Faces in the clouds: A new theory of religion. Oxford University Press. Hinde, R. A. (1999) Why gods persist: A scientiﬁc approach to religion. Routledge. Johnson, D. D. P. & Bering, J. M. (2006) Hand of God, mind of man: Punishment and cognition in the evolution of cooperation. Evolutionary Psychology 4:219–33. Johnson, D. D. P. & Kru¨ ger, O. (2004) The good of wrath: Supernatural punishment and the evolution of cooperation. Political Theology 5(2):159–76. Johnson, D. D. P. (2005) God’s punishment and public goods: A test of the supernatural punishment hypothesis in 186 world cultures. Human Nature 16(4):410–46. Johnson, D. D. P. (2008) Gods of war: The adaptive logic of religious conﬂict. In: The evolution of religion: Studies, theories, and critiques, ed. J. Bulbulia, R.
Johnson, D. D. P. (2009) The error of God: Error management theory, religion, and the evolution of cooperation. In: Games, groups, and the global good, ed. S. A. Levin, pp. 169–180. Springer. Kelemen, D. (2004) Are children “intuitive theists”? Psychological Science 15:295–301. Norenzayan, A. & Shariff, A. F. (2008) The origin and evolution of religious prosociality. Science 322:58–62. Norenzayan, A. (in press) Why we believe: Religion as a human universal. In: Human morality and sociality: Evolutionary and comparative perspectives, ed. H. Hogh-Oleson. Palgrave/Macmillan. Premack, D. & Woodruff, G. (1978) Does the chimpanzee have a theory of mind? Behavioral and Brain Sciences 1(4):515–26. Randolph-Seng, B. & Nielsen,M. E. (2007) Honesty: One effect of primed religious representations. The International Journal for the Psychology of Religion 17(4):303–15. Randolph-Seng, B. & Nielsen,M. E. (2008) Is God really watching you? A response to Shariff and Norenzayan (2007). The International Journal for the Psychology of Religion 18(2):119–22. Rappaport, R. A. (1999) Ritual and religion in the making of humanity. Cambridge University Press. Rossano, M. J. (2007) Supernaturalizing social life: Religion and the evolution of human cooperation. Human Nature 18:272–94. Shariff, A. F. & Norenzayan, A. (2007) God is watching you: Priming God concepts increases prosocial behavior in an anonymous economic game. Psychological Science 18(9):803–809. Sosis, C. Genet, R. Genet, E. Harris & K. Wyman, pp. 111–117. Collins Foundation Press. Sosis, R. & Alcorta, C. (2003) Signaling, solidarity, and the sacred: The evolution of religious behavior. Evolutionary Anthropology 12:264–74. Sosis, R. & Bressler, E. R. (2003) Cooperation and commune longevity: A test of the costly signaling theory of religion. Cross-Cultural Research 37(2):211–39. Sosis, R. (2000) Religion and intragroup cooperation: Preliminary results of a comparative analysis of utopian communities. Cross-Cultural Research 34(1):77–88. Sosis, R. (2004) The adaptive value of religious ritual. American Scientist 92:166–72. Sosis, R. (2005) Does religion promote trust? The role of signaling, reputation, and punishment. Interdisciplinary Journal of Research on Religion 1(1):1–30. Wilson, D. S. (2002) Darwin’s cathedral: Evolution, religion and the nature of society. University of Chicago Press. Wilson, D. S. (2005) Testing major evolutionary hypotheses about religion with a random sample. Human Nature 16(4):382–409. Hey Matt, good to see you posting. Since this blog is "Atheism: Proving The Negative" and not a psychology blog, I assume that this particular report is meant to have some relevance to the case for/against atheism. In light of this, I'd suggest that even if the report is true, it would be irrelevant to this blog. Consider Angus Menuge's point. "Someone might have a hyperactive arithmetic detector, and think virtues can be multiplied, or tastes subtracted. Would that show arithmetic is false? [...] Materialists seem to have a Hyperactive Agent Suppressor Device, denying the human self, free will etc. [...] Suppose we don't like mathematicians, assume there something wrong with them, and demonstrate what's going on in their brains when they do math. Would that show that mathematics was false? Would it show that mathematics had no connection to objective reality? He quotes C.S. Lewis: "You must show that a man is wrong before you start explaining why he is wrong. The modern method is to assume without discussion that he is wrong and then distract his attention from this (the only real issue) by busily explaining how he became so silly. In the course of the last fifteen years I have found this vice so common that I have had to invent a name for it. I call it "Bulverism"." -- Bulverism is a useful fallacy title to this day (an type of Ad hominem circumstantial). Similarly, Leon Wieseltier: "It will be plain that Dennett's approach to religion is contrived to evade religion's substance [...] That is a very revealing mistake. You cannot disprove a belief unless you disprove its content. If you believe that you can disprove it any other way, by describing its origins or by describing its consequences, then you do not believe in reason [...] The power of reason is owed to the independence of reason, and to nothing else. Evolutionary biology cannot invoke the power of reason even as it destroys it." Incidentally, if we believe that evolution delivers us false beliefs in the way suggested, then we might have an undercutting defeater for our belief that evolution delivers us false beliefs. I also think an unfortunate trend in some of these posts is a sort of one-sided skepticism. I'm reminded of "the gorilla-problem" and related promotions of skepticism here that are not applied to your "side" or your conclusions (at least not that I've seen; I might be wrong about this). Either way, thanks for the thoughts. Blake, the fallacy term you're looking for is the genetic fallacy, and no, I'm not committing it. Interesting question though. Yes, the blog is about proving atheism. 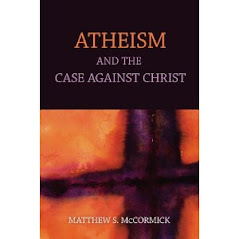 And I have given many of what I take to be substantial arguments against theism and in favor of wide and narrow atheism. But it's a big topic, and no one can do everything in every post. First, when we consider the religious beliefs of some stone age tribe from the jungles of Borneo, for example, the facts about the origins of their religious beliefs, and the considerable knowledge we have about religious beliefs and their cultural, historical, and psychological context are relevant. Part of why you don't think Paluga is real is because of where the mythology comes from and who is claiming he is real. That's why, presumably, you don't take the gods of ancient Norwegian culture very seriously. While logically the presence of a hyperactive religious disposition doesn't disprove any religious claim in any deductive sense, it certainly raises questions about what gave rise to the belief in the first place. And once we've established that theism is mistaken (which I have devoted hundreds of posts to) then the question remains, "why do so many people believe?" That turns out to be one of the most interesting and important questions of our time. "It will be plain that Dennett's approach to religion is contrived to evade religion's substance"
"That is a very revealing mistake. You cannot disprove a belief unless you disprove its content." What does he mean by disprove a belief? Show it to be false? Many things are false because the premises they lie on are false or nonsensical, having nothing to do with the substance of the actual belief. I believe unicorns exist. In order to fulfill his requirements to prove me wrong, you'd have to dig up every fossilized remains, read every historically accurate book to prove otherwise. "If you believe that you can disprove it any other way, by describing its origins or by describing its consequences, then you do not believe in reason"
-How is that not reason? The "origins" is how you'd disprove my belief in unicorns. Origin: They were fictional creatures made up several hundred years ago. Your comparison of the article to the title of Dr. McCormick's blog is utterly nonsensical and irrelevant. An important study shedding light on how we can come to incorrect beliefs, in evolutionary terms, is absolutely relevant to a blog about religion and atheism. The assumption in the study is that you recognize that religion is a false belief. There are plenty of examples of non religious mis-beliefs. "You must show that a man is wrong before you start explaining why he is wrong." Hence the title of Dr. McCormick's blog, and his hundreds of other articles and arguments.